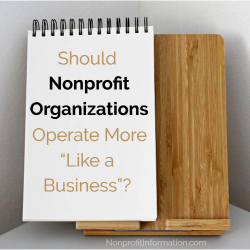 Should Nonprofit Organizations Operate More “Like a Business”? Experienced executives and managers in the nonprofit sector can often provide a wealth of wisdom, insight and perspective into the practical realities that go along with leading mission-driven, “helping” oriented organizations. As such these programs are purposed to provide mission-critical services to the clients and communities they serve. These “nonprofits” over the years have dealt with an evolving range of societal problems and needs. They include serving individuals with physical and mental disabilities, those who lack safe, affordable housing, the homeless, impoverished families, troubled, incarcerated youth, victims of abuse and violence adults and children, those suffering the serious and sometimes fatal consequences of alcohol and drug abuse to those persons simply in need of safe harbor. Everyone is impacted, in some way, by these societal problems be it a direct relationship to the affected person(s), their families and friends, to employers, companies, our economy and local communities. Nonprofit organizations are vital to our socio-economic way of life and in fact make up one of the largest employment sectors in the United States. The mission, purpose and presence of nonprofits is, in many ways, unique to our American way of life. With that in mind, the challenge for nonprofits organizations is often that of trying to respond to the growing needs and expectations by those seeking services and having limited financial and/or physical resources to meet those demands. Overriding this charge is the expectation that services offered be of the highest quality and not compromised for the sake of meeting overwhelming demands. In some instances, service organizations, funders, evaluators and governmental entities have been forced to adjust their criteria and measures of quality and eligibility for the sake of trying to balance the resource gap between demands and capability. Examples include health care coverage variances and cost limitations, “teaching to the test” versus assessing students overall knowledge and applying practical learning concepts in our primary educational institutions and the recent and more stringent re-definition of homelessness by the US Department of Housing and Urban Development. To be fair, significant strides have been made in allaying the even more serious impact of many of such potential shortcomings, due to the effectiveness and ingenuity of community-based, charitable and other third sector nonprofit organizations. As a consequence, a common refrain heard over the years by many who have led or are currently leading charitable nonprofit organizations is “nonprofits would do a better job if they operated more like a business” While there is not a universal and common framework for non-profit management, as is typical in the business and government sectors nonprofit organizations are, uniquely different entities and as such managing and governing present inherent differences. In the absence of more formally identified management frameworks for nonprofits (also known as “third sector”) organizations, however, they are frequently under pressure to look like and be like something else. It is not uncommon for nonprofits to be advised (by others not in the field) to become more structured and acculturated as businesses and entrepreneurial ventures to be more successful. These recommendations are often voiced by well-intended and dedicated private sector professionals and others, many who also serve on nonprofit boards, are volunteers and donors offering tremendous guidance, financial support and insight. The implication of their advice is “our way is better than yours” and nonprofits would better meet their obligations and commitments to the community by adopting and more “business savvy” approaches. It only makes sense to believe that a more business-oriented approach would lead to more “profitable” outcomes. So, given this, having non-profits operate more like businesses seems to be a logical conclusion. A simple business definition is to say that “business occurs when a person or organization profits by providing goods or services in exchange for money.” (Duhaime’s Law Dictionary). The conclusion, given such varying descriptions, is there seems to be no one common definition of what is a “business?” and may be best applied given the situation or endeavor. Certainly, one common theme that runs throughout these definitions is to equate business with profits though deviations in definition seem to be subject to interpretation from there. Nonprofit and other third sector organizations comprise America’s largest employment sector and a national growth industry. Nonprofits are considered helping organizations and “change agents” and are guided by community needs, problems and goals and providing for the common good. In the nonprofit world, measures of success are typically based on “softer” criteria that are more difficult to quantify than bottom line profits. Examples include how many people have been positively impacted and are changed human beings and assessing the social/emotional health and wellness of our communities. Having a large positive bottom line (surplus vs. profit) may, in fact, be an indicator that services invested in are not being fully rendered to fulfill the nonprofit organization’s stated mission (Nonprofit Quarterly, July 2013). Only about 30% (one third) of businesses or entrepreneurial ventures will survive their 10th year in business (U.S Department of Labor Statistics, 2016). This is not a model that suggests it be applied to nonprofit start-ups. The average tenure of a corporate CEO is 4.9 years (Fortune Magazine) versus 12 years for nonprofit CEO’s (NonProfit Times), suggesting perhaps more stable and experienced leadership resides in nonprofit realm. To conclude, it seems most accurate to define nonprofit mission driven organizations as already operating as businesses. While for profit and not-for profit entities may be configured differently and serve different purposes in the marketplace both are and complementary and exemplify the best in of our American “business” way of life. Drucker, Peter. The Third Sector-America’s Non-Market Counter Culture. Social Contract Journal: Winter 1990-1991.